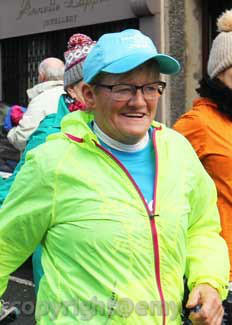 Congratulations to Geraldine: Prior to the start of the Crocus Run in Monaghan, on the morning of 2019 St. Patrick’s Day, tributes were paid publicly to Geraldine McAree by AnnMarie McCleary as this is the 40th Anniversary of Geraldine’s involvement in Athletics. As a competitor and participant she has covered miles and miles each year and most of those miles were to raise funds for many Charitable organisations. As a coach with Glaslough Harriers, and individually, she trained a big number of athletes, many of whom went on to win honours at local, national and indeed international level. However, even those who did not go on to the big stage in athletics, benefited greatly from Geraldine’s coaching healthwise and had a very healthy pastime during their formative years. She more recently decided to get the ‘older’ ladies involved in running and walking and the Jolly Joggers came into existence. 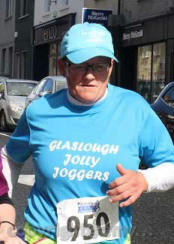 They in turn, with Geraldine’s leadership, began the New Years Day run/walk in Emyvale 10 years ago and have raised €56,000 for North Monaghan Cancer Treatment Support as a result as well as giving hundreds the opportunity of spending a few hours on New Years Day in a very sociable and healthy manner. Our sincere congratulations to Geraldine for the r40 years of voluntary service to the community and we wish her many more years of jogging, running, walking and leadership in our community.